A luxurious organic treat for hard-working feet. 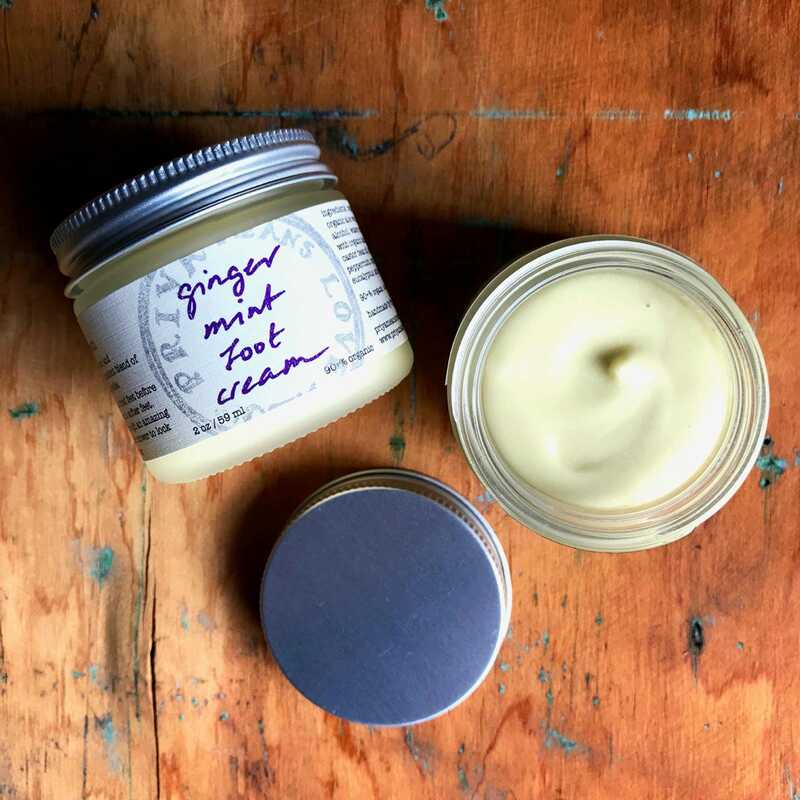 This thick, whippy cream is completely vegan, radically all-natural, and handcrafted from wonderful organic and wildharvested ingredients. Warming ginger, cooling peppermint, penetrating eucalyptus and relaxing lavender combine to put a whole lot of aaaah into tired, aching feet. Calendula blossoms and a decadent blend of organic oils soften rough heels and soles. A little of this deliciously aromatic, rich cream goes along way. Smooth onto tired feet before bed, don cotton socks, and wake up to softer feet. Slip, glide, and tingle your way through an amazing foot massage for yourself or shared with a partner. Apply after a bath or shower to lock in moisture. A terrific way to end a pedicure! Ingredients: organic extra virgin coconut oil, organic sunflower oil, organic aloe vera gel, water, extract of organic bourbon vanilla beans (organic grain alcohol, water, organic vanilla beans), organic extra virgin olive oil infused with organic calendula blossoms, wildharvested candelilla wax, organic castor bean oil, organic rosemary extract, and organic essential oils. 90+% organic. Always 100% natural. The scent is divine and love the texture! I knew I’d like this one but it’s better than I imagined. Would also be good as a refreshing blended smoothie drink :) Thank you for the sample! My favorite Etsy seller! Priya’s items are so thoughtfully made and such high quality. Will gladly to continue to purchase from her. This foot cream is great! It's very moisturizing. It has a nice cooling effect from the peppermint and warmth from the ginger. I'll be using this all year round I think.